Download the latest version of Kitematic via the github release page. Kitematic's documentation and other information can be found at http://kitematic.com/docs. Security is very important to us. If you have any issue regarding security, please disclose the information responsibly by sending an email to security@docker.com and not by creating a github issue. We welcome all pull requests and contributions that anyone would like to make. The Kitematic team is super happy to support anyone who wants to get involved. Please checkout our roadmap that we keep up to date for ideas to help you with contributing. We would love to talk to you about contributing. Ask questions on our user forum. #kitematic on IRC. Join the channel. Code released under the Apache license. 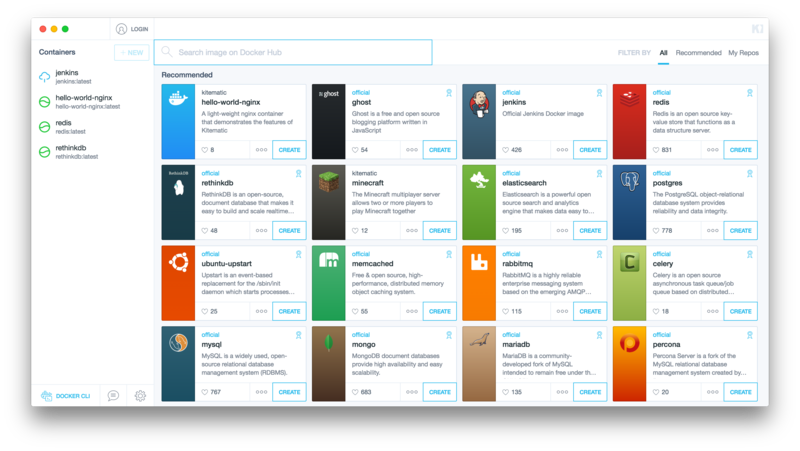 Images are copyrighted by Docker, Inc.